Madhavi hails from a simple background, but she was a very hard-working girl who had wishes she wanted to fulfil. Madhavi had been saving money for years to be able to move into a small house. When she got married to Ashok, and they moved into a rented house, she shared her dreams with her husband, who happily agreed to help her with the same. Madhavi and Ashok are both teachers. The couple started to save every penny they could. The couple was blessed with a baby boy. 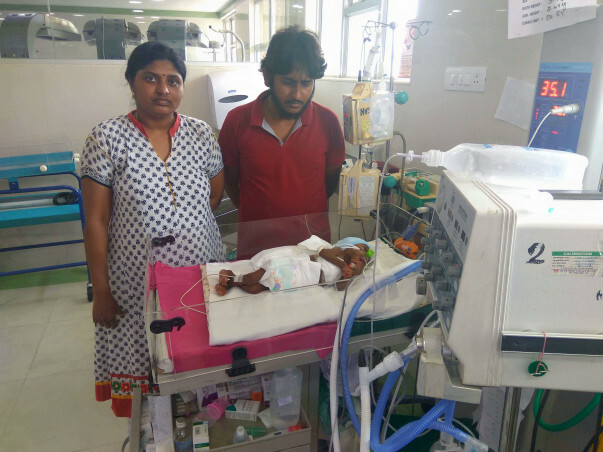 Before they could even name the little one, he started suffering from frequent spells of fever and had to be taken to the hospital again. He was diagnosed with a short bowel syndrome. He has undergone around 5 surgeries already. Due to the constant care needed, both Madhavi and Ashok have quit their jobs to be able to take care of their new-born child. “We have spent all the money we had saved. I had been collecting every penny for the last 8 years, sacrificing many things I could have done instead. What is the point in having a house if there is no family there! We have spent over 10 lakh. That is all we had. We haven’t even spent a penny on accommodation. Friends, relatives, we have knocked on all doors we found.” Madhavi says. The couple put up a tough fight, and they have almost made it. A final, but crucial month of treatment and observation lies ahead. The baby’s condition is very fragile. He is still suffering from an infection and a liver problem, and must gain some weight to show some improvement. 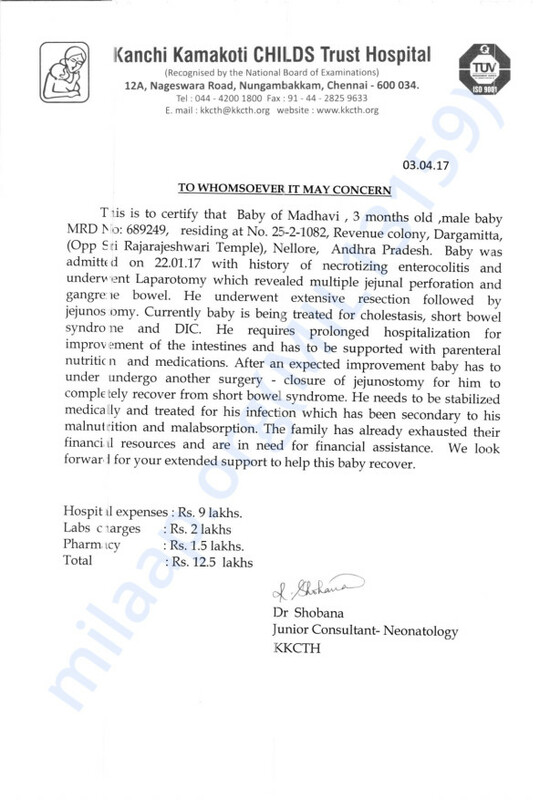 Babyof Madhavi expired today after 4 months of treatment. Due to short bowel syndrome and progression to multiorgan dysfunction.